Thanks to Ms. Heitzman we have can read a blog and see fantastic photos of an amazing fish with bifocal eye lenses. 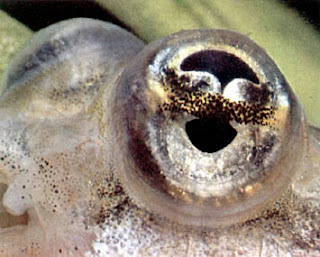 This fish has one eye with two lenses; one to see above water and one to see below water... at the SAME TIME. Be warned, the blog it is on is called "Ugly Overload." These reminders are for all my classes, so just identify the ones for your class. Welcome to Mr. Cantor's Biology Blog for students at North-Grand HS in Chicago. You will find assignments, links and other helpful information here. When commenting, only use your first name and last initial if you want your comment to be published. If you need help you can see me in room 125 after school from 3:00 to 4:00. You can also e-mail me at ptdworkin-cantor@cps.edu. Get automatic updates of this blog.